« Jump Force and Cup Noodles Team Up! 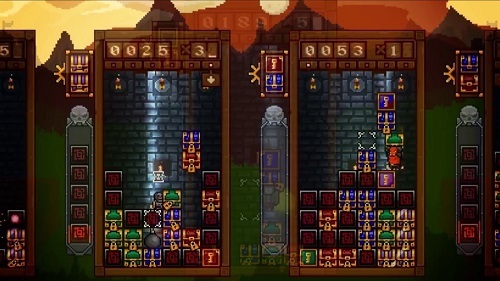 Treasure Stack is a medieval themed falling block puzzle game for Nintendo Switch, Xbox One, and PC (reviewed on Switch here). You control a character at the bottom of the well, and different colored treasure boxes fall in. Pick up and move the treasure boxes however you like, and match them with the same colored blocks with keys to open them and get the coins inside for points. This’ll also make the treasure boxes disappear, too. When a stack of boxes reaches the top of the well, you lose. Up to four can play at the same time either locally or online. Use the control stick to move your character around, and one button makes you jump. But you can only clear one block high with your jump, so be careful not to get boxed in. Another button lets you pick up and place down a whole column of blocks next to you. Press down and the button to warp to the top of the stack. You can also use a grappling hook to bring down falling pieces faster to you. Be on the lookout for special items like swords and chalices that can clear out whole rows and columns. By getting a certain number of coins, you can unlock new characters to play as and grappling hooks to use. If this sounds a lot like another puzzle game called Wario’s Woods, that’s because it is like it! But Wario’s Woods offered more control options for picking up blocks and moving around. Treasure Stack is still a fun puzzler, and I like the pixelly graphics, but it just makes me rather go play Wario’s Woods instead. Nothing violent or objectionable here. Reading skill is helpful for some of the text, and younger gamers may have trouble with the floaty and complicated controls. Treasure Stack is rated E for Everyone.